It is surely remarkable, as well as fortunate, that four  monuments remain in the main church of the Abbey of Fontevraud , having survived the Religious Wars and the Revolution, when much destruction occured. The monuments are essentially similar but with interesting variations: each figure is recumbent, lying on a bier carved to appear as being covered with a draped cloth; the bier is raised at the head and feet so that only a simple pillow is required to support the head. Isabelle’s monument shows a greater variation than do the others, not only is it significantly smaller , it is also made of wood. All four monuments have been painted several times in the past but this polychrome is now faded and worn so that, whereas the other three monuments appear light in tone, being made of tuffeau, a local pale yellow Cretaceous limestone , that of Isabelle appears much darker from the wood below. 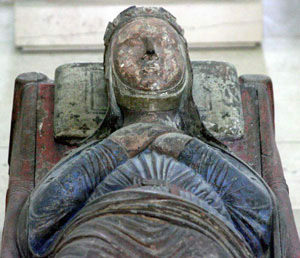 This tone difference is particularly noticeable as the monument of Richard the Lion Heart, which is placed next to that of Isabelle, is the most worn, and hence the palest, of the other three. The drapery over Isabelle’s bier, as well as the bier itself, is red with a darker border, probably originally gold, and semé with probably gold flower heads. Isabelle herself is represented as recently deceased with her hands folded on her breast, quite unlike Eleanor, who is shown alive reading a book. She wears a long blue gown which is open at the neck to show a white underdress, which is closed at the neck by a clasp. She wears a red girdle around her waist with a gold buckle and evidence of other metalwork. Her mantle, which is wrapped around her body, as are those of the other effigies, now appears brownish on the outside, although it was probably gold, and greenish on the inner aspect where it is folded back. It is held in place by a girdle, also probably gold, across her breast. The monuments are now believed to be in their original positions in the final bay of the nave. This is based on the somewhat vague descriptions of contemporary chroniclers , the discoveries of a plan of the abbey from 1762 and of the coffin of Raymond VII in 1910 which may indicate the original burial site. The church has been extensively excavated in recent times but no sign of remains, graves or coffins of the Plantagenets has been found. It is likely that these were disturbed when a burial vault for the abbesses was constructed on the order of Abbess Jeanne-Baptiste de Bourbon in 1639. Isabelle was first buried in either the nuns’ cemetery or the chapter house: both accounts occur although these may refer to the same place. Her son, King Henry III , visited Fontevraud in 1254 and ordered that his mother’s remains be moved to the choir, an act that was carried out with some ceremony, and that a monument be constructed over her grave. The abbey was dissolved in 1792, bought by a farmer in 1796 and turned into a prison by Napoleon in 1804. In 1816, Charles Stothard, who was travelling in France, found the monuments in a cellar  and proposed they be send to England for safe keeping. Although this was approved by the French government, there was much local resistance and the Prefect of Maine-et-Loire ordered the prison authorities to move them to a ‘disused passage’ off the cloisters. Two years later, following a similar request, they were moved to a chapel south of the transepts. Later they appear to have been moved to the famous and much photographed Romaneque Kitchen. In 1846 the monuments were taken to Versailles for a much criticised restoration and this may be the time when they were finally painted in the state we find them today. They were returned to the abbey in 1849 and displayed in the cloisters; in this year the abbey was classified as an ancient monument . In 1866 the Pall Mall Gazette again proposed that they be moved to England and displayed in Westminster Abbey; on this occasion Napoleon III offered them to Queen Victoria. Today I think we can be thankful that this quite wrong and historically ignorant – the word ‘returned to England’ had been used – proposal was never carried out. In 1909 the abbey was put under the protection of the Department of Ancient Monuments and in 1930 the monuments were displayed in one of the transepts, an arrangement that often appears in reproduction of photographs even now. The main prison was closed in 1963 although some of the prisoners remained in another part of the complex – the Madeleine Dentention Centre – until 1985 to work on clearing and restoration of the principal site. The restoration continues today. The monuments were eventually displayed in their present position. In 1975 the Abbey became the Cultural Centre of the South West. There was a rumour a few years ago that the British Government had again requested that the monuments be sent to England; however this was firmly denied by the Foreign Office. The three other monuments represent people who died within a fifteen year period of each other so we may assume that they were constructed at more or less the same time. Isabelle, however, died forty-two years after Eleanor, the last of the other three to die. In fact, G. Zarnecki  states that the monument under discussion cannot that of Isabelle for this very reason. This argument is however fallacious as there is no reason why an earlier style cannot be copied. Furthermore if it does not represent Isabelle, then whom does it represent? There appears to be no explanation for this. There is certainly plenty of tuffeau in the area. Perhaps a stone carver could not be found, although tuffeau is much easier to carve than wood. Henry III visited Fontevraud in 1254 and requested that a monument to his mother be made. Perhaps a sufficiently large block of tuffeau could not be quarried and transported in time for him to see the finshed result. Perhaps it was a prototype to show to Henry for a stone effigy which was never realised. Isabelle was born about 1188 being daughter and sole heiress of Count Audemar of Angoulême, a large French county and part of the ‘Angevin Empire’, which King John had inherited from his father and brother. 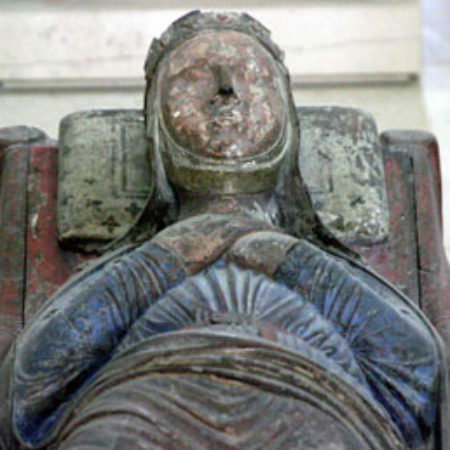 As a child she was bethrothed to Hugh le Brun IX, Lord of Lusignan, whose lands again were in this ’empire’, but King John married her in August 1200 when she was but twelve years old. Was this a passion for the young girl or were there more political reasons: Hugh had already aquired the large county of Le Marche and with his marriage to Isabelle he would have aquired Angoulême also, giving him an area of land as large as the Duchy of Normandy. Unfortunately, John was no diplomat and instead of compensating Hugh in some way, he confiscated the county of Le Marche which he granted to his new father in law. This lead to a diplomatic and armed struggle between John and the Lusignans and led to Hugh appealing to the French King, Philip Augustus, over the head of John, his immediate overlord. The final result was the confiscation of the Duchy of Aquitaine from John and the beginning of the loss of the Angevin possessions. It has been said that Isabelle was thus indirectly responsible for the loss of these lands. John and Isabelle had five children, including the future Henry III. She succeeded to Angoulême on the death of her father in 1202 and returned to her county following the death of John and the crowning of her son in 1216. In 1220 she remarried: this time it was to Hugh le Brun X, lord of Lusignan and Count of Le Marche – the son of the man to whom she had been betrothed twenty years earlier. (or did she marry the father, her original finace – both stories appear) This was also a diplomatic move as it aided the Angevin interest in this part of France. From this marriage she was to have nine further children. In fact her new husband had been promised to Isabelle’s own daughter, Joan, but she was now promised to Alexander II of Scotland instead. After some diplomatic wrangling, which even involved their threatened excommunication by the pope, involving the English Council withholding Isabelle’s pension and dower lands and she and Hugh withholding Joan and her portion in retaliation, this matter was eventually resolved. In 1241 Isabelle joined an English backed conspiracy with Raymond VII of Toulouse (her nephew by marriage) to unite the South and West against Louis IX. There appears to have been some antagonism between Isabelle and the Queen Dowager of France, Blanche, because the latter had supported the French invasion of England against John which had been instigated by the English barons. It is said that Isabelle bribed two of the French King’s cooks to poison Louis. In 1244 this plot failed and Isabelle retired to Fontevraud, where she died in 1246 at the age of about 58. There were several others: some lost and some fragmentary ones still in existance. This has been cobbled together from a number of contradictory sources; I will revise this as I glean further information and post it on the main site.